An Italian cheese made from cow's milk, with a flavor that varies from slightly sharp to strong or pungent, depending on the age. 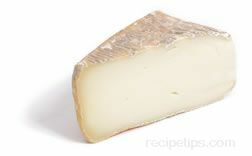 The young cheese is pale yellow and semi-soft, while the mature cheese is creamy white with a pinkish-gray crust and a soft, smooth, somewhat rubbery texture. Continued aging produces a darker yellow color and a soft, runny consistency. The flavor of the Taleggio cheese goes well with a robust wine or it is an excellent dessert cheese when paired with fruit, and a nice complement to salad greens. It is a good cheese for baking as it melts well and retains its shape.